Home of the New England Patriots for more than 30 years, Foxboro Stadium was one of the NFL’s worst stadiums. During the Patriots first 11 years of existence they played at several different stadiums. During the Patriots first year, 1960, they played at Nickerson Field. Over the next eleven years they played at Fenway Park, Alumni Stadium and Harvard Stadium. The Patriots wanted a permanent place for the team to play at. Foxboro, MA was chosen as the site for a stadium for the Patriots. Construction began on September 23, 1970 and was completed in just under a year for the start of the 1971 NFL season. No public funding was used to construct the $7.1 million stadium. It was originally named Schaefer Stadium after the Schaefer Brewing Company. From 1983 until 1989, the stadium was then named Sullivan Stadium, after the family that owned the Patriots. Finally, it was renamed Foxboro Stadium in 1989. The New England Patriots played their first game at the stadium against the New York Giants on August 15, 1971 when over 60,000 fans filled the stadium. Foxboro Stadium consisted of one-tier grandstands that were located on both sides of the playing field. Seating areas also extended beyond the end zones. The main scoreboard was located above the seats in the south end zone. 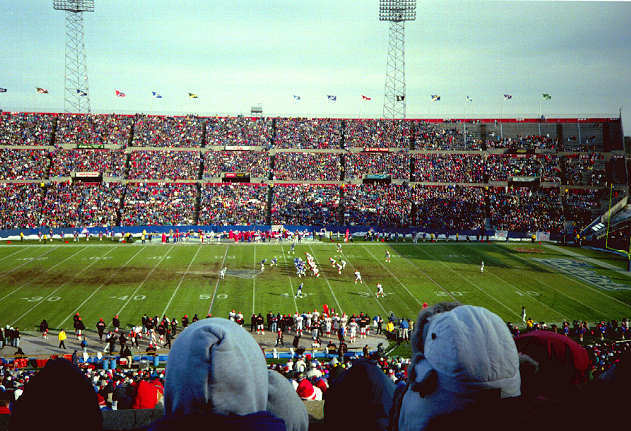 Foxboro Stadium was composed of mainly bleachers, but did have some regular seating areas. Foxboro Stadium underwent $10 million in improvements after 1993 when Robert Kraft bought the team. In addition to being the home of the New England Patriots, Foxboro Stadium was the home of the New England Revolution (MLS). Foxboro Stadium also hosted the 1994 World Cup Soccer Championship. The last game at Foxboro Stadium was a snow covered game vs. the Oakland Raiders on January 19, 2002. The stadium was demolished in the spring of 2002. The Patriots moved into Gillette Stadium the next year.